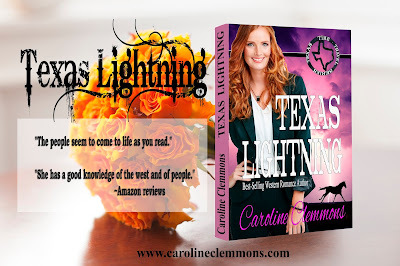 A slight departure from my usual Science Fiction posts and guests today as I welcome Caroline Clemmons to talk about her new book 'Texas Lightning.' Still in the paranormal vein though as it's time travel. Texas lighting is the first of Caroline's Texas Timetravel series. I'll pass you over to Caroline to tell you all about it. Thanks to Hywela Lyn for hosting me on her blog. 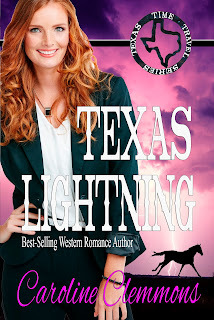 I’m excited to tell you about TEXAS LIGHTNING, the first of my Texas Time Travel Series trilogy (Try saying that fast three times ☺). Reader reports have been very enthusiastic. The second and third of the trilogy are TEXAS RAINBOW, releasing April 18, and TEXAS STORM, releasing May 25. Years ago I discovered the time travel books of Kathleen Kane before the author switched names and subgenre. I fell in love with time travel featuring ordinary people. I also have enjoyed the time travels of other authors, such as Beth Trissel, Linda LaRoque, Diana Gabaldon, and Peggy L. Henderson. I especially enjoy the idea of a character from the past coming forward to today. Think about it—when someone goes back in time, they know what’s going to happen in that era. On the other hand, when a person comes forward, everything is new and requires huge adjustments in learning and attitudes. What a challenge for a character—and what fun for the reader. If there’s mystery and/or suspense, even better. This is what I wrote in OUT OF THE BLUE, when an Irish woman from 1845 plopped down in contemporary Texas to help a detective solve several murders and discover who was trying to frame and kill him. Except for this book, my new trilogy is a departure from the usual books I write, but still in a western setting. TEXAS LIGHTNING depicts Penny Terry as she stumbles forward into a complicated scheme to steal the ranch that had been hers. While unraveling the mystery, she learns why her father was killed. In this case, there’s even a fabulous treasure. Of course, she also falls in love. How can two people from different eras own the same ranch? Penelope Jane Terry knows everything about ranching in spite of being a lone woman. She is determined to send to jail the rustlers who believe they can steal what is hers… until she is caught spying on their dirty works and must ride for her life. What Penny doesn’t count on is being hurtled over a 120 years into the future. Jake Knight believes the attractive woman who stumbled into his home one rainy evening either has amnesia or is certifiably insane. Unless, that is, she is in league with whoever is trying to drive him out of business. Someone is trying to force him to sell his ranch by staging a string of damaging incidents. Jake’s been kept so busy making repairs that he can’t run his ranch properly. Even if he were stupid enough to wish to sell, the ranch is so firmly entailed that no one can break the conditions. Jake gradually learns Penny is who she claims, no matter that time travel is supposed to be impossible. They’re locked into a clash only one of them can win. If an outsider weren’t trying to kill Jake as well as bankrupt him, perhaps he and Penny might be able to reach an agreement. And, then they discover there is a huge treasure…. Finally, the lights of home shone faintly in the distance. Nothing had ever looked so good. She couldn’t keep going much further. Damned if blisters hadn’t burned on her heels from walking so far in wet boots. She was near frozen in these wet clothes. How could she be so cold now when the heat earlier had nearly suffocated her? Nevermind, she just wanted to be home, safe, and in her bed. There stood the fence next to the paddock. Almost home now, keep walking. Don’t pass out, don’t fall. One foot in front of the other. You can do this. Stumbling from fatigue, she labored up the front steps onto the long wrap-around porch and bumped into a rocker. Who’d put that there? Just like her cook to move stuff around without telling her. How she’d love to sink into it and rest. First, she had to send for the sheriff and find out if Star came home. At the door, she paused and listened for men talking—rustlers waiting to waylay her. She heard no sound. Lights shone so brightly, her cook must have waited up for her with every lamp in the house lighted. She eased open the door, listened again, then walked in and leaned her rifle against the stair’s banister. “Did Star come home?” She unbuckled her gun belt and hung it on the newel post—not something she’d do under ordinary circumstances. Tugging off her gloves, she avoided a couple of cactus spines stuck in the fingers. How had they remained there without her feeling them? No matter, she sat down on the third stair tread to remove her boots. She should have gone around to the back door, but she couldn’t walk another step. Weariness and sore muscles overwhelmed her and she wanted nothing more than to shuck out of her wet things and lie in her nice bed—if she could summon the energy to walk upstairs. Eyes closed, she leaned back against the stairs. She heard footsteps approaching and raised one foot. Whoa! The man who faced her was a stranger. In spite of her wariness, her mouth dropped open in awe. Instead of her arthritic middle-aged cook, this man was young and tall and definitely fit. And handsome. Unbelievably, mesmerizingly handsome. He might be as comely as a fairy tale prince, but the regal disapproval on his face appeared anything but friendly. He crossed his arms and ignored the Winchester pointed at his middle. His dark hair glistened in light that seemed too bright. Dark blue eyes had tiny creases at the corners, as if he laughed a lot. He sure wasn’t laughing now. The dog growled, the fur of his ruff bristling. Who was this man? He didn’t look the type but maybe he was one of the men stealing her cattle. Could he and his dog have been waiting for her? She gripped the rifle with all her strength. Why hadn’t her cook shown up to help her? Oh, no, had they killed him? Increasing fear spiraled inside Penny, knotting her stomach. How could this man think her dead? What kind of trick was he working? Had she been conked out long enough that her cook sent men out to look for her and they decided she’d died? Through a crazy twist of fate, Caroline Clemmons was not born on a Texas ranch. To make up for this tragic error, she writes about handsome cowboys, feisty ranch women, and scheming villains from a small office her family calls her pink cave. She and her Hero live in North Central Texas cowboy country where they ride herd on their rescued cats and dogs. The books she creates there have made her an Amazon bestselling author and won numerous awards. Find her on her blog, website, Facebook, Twitter, Goodreads, Google+, and Pinterest. What an intriguing excerpt! Not many people know this, but Historical Westerns were my first love, before I started writing S.F. romance and I even trained my horses western style, and changed from English to Western tack. I do envy you your stay on a dude ranch, I always wanted to do that! I did manage a visit to the U.S. though and stayed at a guest house owned by a lovely lady who had an Apaloosa, Arabian and Hafflinger horses. This series is definitely one for my TBR list! Thanks Caroline and wishing you much success with this new series. Thank you, Maureen, and thank you for taking the time to comment. Wow! I love the premise behind all these books. The excerpt was great. Thanks for sharing! Good luck to you. I think you've got a great trilogy on your hands. Very worth reading. Hi Kara, thanks so much for visiting and commenting - I loved that excerpt too, and I agree, this sounds like a wonderful trilogy. Kara, thank you for your comment and kind words. Hi Maureen - thanks so much for stopping by and for commenting. Hope you enjoyed reading about Caroline's new series. What a great hero and heroine you've created! Loved the excerpt. They do sound wonderful don't they, so glad you enjoyed the excerpt, Alina, thanks for visiting. Alina, thank you for the kind words and for your taking the time to comment. Thanks again, Lyn, for hosting me on your site. Best wishes for your continued success! You're so welcome, Caroline. Thanks for the good wishes and the same back to you! I'm so excited about this new series! And the first book will be my reward for finishing my current manuscript. Yay! Hi Jacquie, great idea to reward yourself with this book when you finish your current MS - I must remember to do the same! Thanks for stopping by. Thanks for your support and encouragement, Jacquie! Western Time Travel Series....Wow...sounds intriguing and the excerpts are great! Pamela, thank you so much for your encouraging comment--and blessings are always welcome! What a great excerpt. I love it. Thanks for sharing. Hi Connie, glad you enjoyed the excerpt! Thanks or stopping by.